The “Santa Fe” look is the most coveted style this season, and where better to achieve this look then visiting…..Santa Fe! For authentic turquoise treasures, leather, fringe, southwestern art, and an opportunity to experience the relaxed Santa Fe lifestyle, book your visit today. You will not regret it! You will be drawn to walking up and down Canyon Road soaking up the sunshine and taking in all the breathtaking art. The City of Santa Fe is stylish and filled with charm…even our sunsets have style (and are sure to leave you mesmerized!). Now, love bikes, but also love beer? 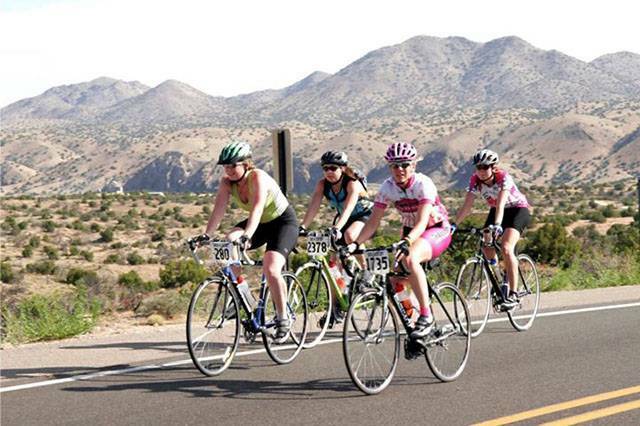 How about the Santa Fe Bike and Brew fest? It is five full days of bikes and craft beer in the cultural capital of the Southwest (Santa Fe, of course!). Join Outside Santa Fe for this week of adventure and new friends. And art experiences? There are so many choices, but here are a few that really stand out. This is a special event that connects art lovers with world-class artists and galleries in the famed art destination. The celebration is held annually on Mother’s Day Weekend and begins Friday evening with artist receptions and exhibits at many of Canyon Road’s 100 fine art galleries. Art lovers will find incredible art without the attitude. Look over the shoulders of artists, visit amazing restaurants and exquisite shops, and enjoy everything that historic Canyon Road has to offer. Passport to the Arts will also feature a silent auction, music, children’s art projects, and a variety of special shows and exhibitions celebrating the art of Canyon Road. The 4th season began March 1st at the Railyard, next to the Farmers Market. 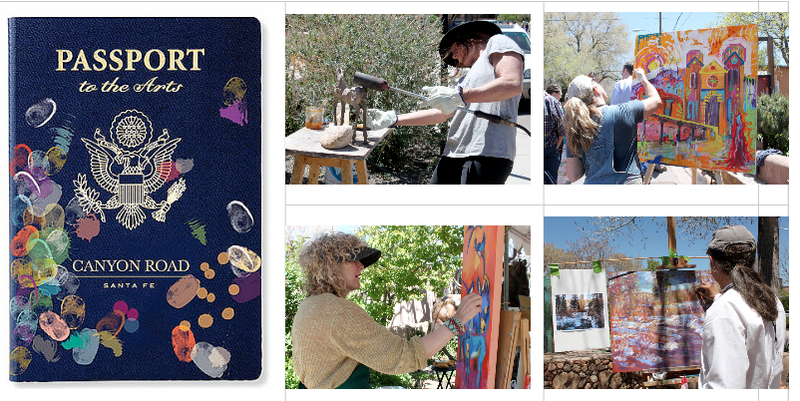 The Artists Market is outdoors with a juried art show, and features many local New Mexico artists. Painting, jewelry, pottery, photography, textiles, wood, metal, glass, multi-media…and so much more! The Santa Fe Society of Artists Fine Art Show is where you can meet Santa Fe’s premier local artists and enjoy their exceptional and diverse talentsǃ A vital part of the color, festivity and creativity that draws visitors to Santa Fe, the SFSA outdoor fine art shows afford an opportunity to experience firsthand an important part of Santa Fe’s culture. Visitors cannot only take home with them fine art paintings, printmaking, photography, and sculpture, but also the memorable experience of interacting with the artists. This is located just west of the Historic Santa Fe Plaza, across from the Museum of Fine Art on Palace Avenue. The Mine Shaft Tavern brings in fresh live crawfish from Gulf Coast region for the 8th Annual CrawDaddy Blues Best! Hosted by The Mind Shaft Tavern, Guest Chef Trey Corkern will be cooking up 1,000lbs of Crawfish, as well as helping prepare lots of other special Cajun dishes. In addition, hamburgers, BBQ and many other foods will be available. There will be a full bar and plenty of shade. The event will be held May 16 and May 17, noon – 8pm, next to the Madrid Old Coal Town Museum. Advance Tickets ＄15 Per Day (＄20 at Gate) / ＄25 Both Days. Kids under 12 are free. This same weekend (May 16-17) is the Santa Fe Fiber Arts Festival. Fiber arts market and demonstrations on wool washing, dyeing & spinning, weaving and more, will leave you inspired! So, book your tickets today and enjoy an authentic Santa Fe experience! For more Santa Fe style, visit our Pinterest board by clicking the image below!